So it's been a while since I've posted. I haven't died, just busy doing other things. But I have got a few things finished recently. So a number of months ago I acquired all the French & Indian War box sets from my friend Jonathan. The first box I started on was a box of Indians. These figures are metal and from Warlord Games (ex-Conquest Miniature figs). Please excuse the crap pics, I've pretty much given up trying to take decent pics. These figs are awesome. Out of the 19 figures in the set only one of them has a duplicate. I just hope my paint job does them some justice. I'm running a game of Space Hulk at next week's St. Albert Games day, so I decided to paint up the figures. The paint job isn't super awesome, but it's definitely good enough for a board game. Pretty sure these are generally 28mm figs. I think I can safely say that I don't want to paint any more Genestealers. 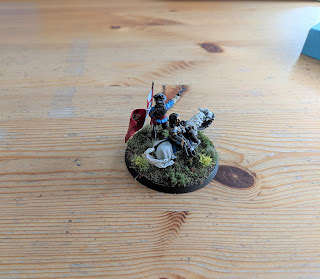 A couple years ago in the Analogue Hobbies yearly painting challenge, Jonathan and I had a challenge to see who painted the most early-World War II figures. The loser had to paint a figure for the winner. I was looking to win the challenge when off the top rope Joanthan came with an elbow and beat me right at the last moment. That was late-winter 2017. So I finally got a figure done for Jonathan. Please the excuse the awful pic as I did it with my phone. 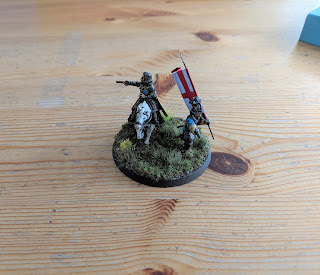 This base is a command base for Jonathan's English Civil War army. It's King Charles and the King's Guard ensign. A pair of nice metal figs from Warlord Games. Next on my paint table is the other half of Space Hulk - 12 Terminators. After that I'm not sure, I think I'm going to work on some terrain.